Good job. I am the worst bird photographer ever. Nice pic.The bird looks so soft against the rough bark. Phoebes are such sweet little birds. Very nice photo. Candace-- I doubt that very much!! Mary-- Sometimes even thistledown looks rough in comparison with a bird's feathers. I think it all depends on the light. I love phoebes, too. S/he's beautiful. Great job! Excellent shot! Bird photos are when I end up deleting a ton of duds before I ever download anything from the camera. Every once in a while I manage to get one. What a sweet looking little bird. She looks similar to our Eastern Phoebe, which I can usually find by it's call of phee-bee. SuziQ-- Photographing any kind of critter takes a boatload of patience, doesn't it? 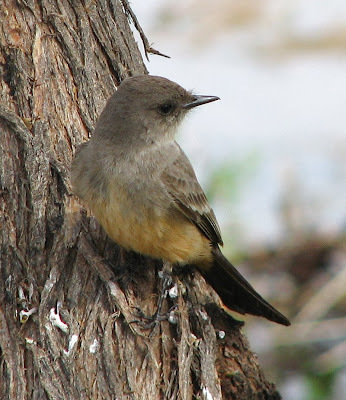 Leslie-- This little phoebe has staked out one particular area at the Water Ranch. I can always find her there.